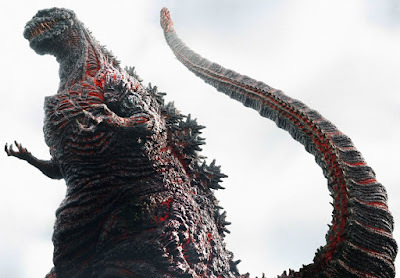 "The Original Gangsta Lizard gets a largely satisfying reboot in Shin Godzilla, a surprisingly clever monster mash best described as the Batman Begins of Zilla Thrillers. Co-directors Hideaki Anno (the cult-fave Evangelion franchise) and Shinji Higuchi (Attack on Titan), working from Anno’s genre-respectful yet realpolitik-savvy screenplay, draw basic elements from Ishiro Honda’s original 1954 Gojira and its many follow-ups — to the point of including a wink-wink, nudge-nudge reference to Goro Naki, a character who loomed large in two sequels — but update the familiar kaiju mythos to a 21st-century world where the sudden appearance of an immense, fire-breathing reptile in Japan can generate all sorts of inter-agency political wrangling, revive terribly unpleasant memories of the country’s militaristic past, and really, really wreak havoc on the value of the yen in global monetary markets. "In short, Anno and Ishihara operate according to a classic sci-fi game plan: This couldn’t happen. But if it did happen, this probably is what would happen." You can read the rest of my Variety review of Shin Godzilla — which Funimation Films will release Tuesday, Oct. 11, in theaters throughout North America — here. And you can read my 2014 tribute to Big G here.